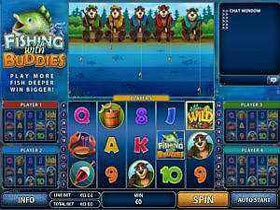 Fishing With Buddies - 5 Reel, 20 Payline Multi-player video bonus slot game. This is an amusing game based on Fishing with 3D animations, and 2 interactive bonus features. This game is very unique and a first ever launched by Playtech. As a "multi-player" game up to 5 players can play simultaneously, enhancing the dynamic of the online gaming experience. Up to 5.00 per line can be wagered on this game. Symbols must match from left to right across the active paylines. 5 000 credits will be won when matching 5 wild coral reef symbols. The top Jackpot is an amazing 10 000 coins. The Fishing based symbols include Coral Reefs, Fish, Bait, Crabs, Bears, Fishing Pails and the basic "Eights through Aces" poker ranks. The Wild will substitute for all symbols except the Scatter symbol. Scatter Symbol - Fishing with Buddies Logo. Land 5 Scatter Symbols to win 500 times the original bet. As the game begins, choose one of the 5 Bears who are fishing together by the lake. The Bear chosen is just to identify you from the other players. Pick a color of Bear: Red, Yellow, Light Blue, Green, and Blue. Once the screen opens, the reels in the middle and the options to change your bets and spins will appear as per usual. The only difference is that miniature versions of the other players’ reels will appear on the left and right of the screen. This enables you to see whether the other players are winning, and how much they're betting. The information for the Bonus round will be very important, including the speed and amount played. A graph box will appear above the reels. As each player places a bet, their fishing poles will move up and down in the water. The pole will go Up when they're playing too slow and low bets. When they're playing fast and for higher stakes the pole will go Down. This info will be vital when starting the Bonus Round. This 2-stage Bonus starts with all 5 Bears holding their reels in the water at different depths, offering each one a fish with a different value. The deeper a pole reaches, the more money will be made as fish swim past getting caught on the pole. This could also become complicated when other players reach the same depth because you will all be competing for the same fish, which could end up costing each other the bonus money. If a Bear had played very slowly, then that Bear could be sleeping without his bait in the water, which gives no chance of winning. Whilst everyone is busy catching fish, there will also be 3 Golden Fish swimming around. Whoever catches these fish gets to play in the 2nd Bound Round, where the Golden Fish get released back into the water for an instant Bonus Prize. The Fish a Crab Feature will be triggered when a Crab appears at the top of a reel during the game. Win up to 5 times the original when entering this round. In a Multi-player game it’s also important to interact with the other players. With this Chat Window players can talk to one another, either congratulating on winning, moan when others are stealing all the fish in the bonus round or sympathize when they lose. This game is really exciting with the Multi-player aspect and the competitive Bonus Round. It’s fun and social to make new friends, and to interact with other players. Enjoy this new way of playing slots, which certainly adds a new challenge to gaming.